Enjoy One Hour of Bliss! Begin your relaxation journey as you slip into a soft terry gown and warm bed. Escape into bliss as you enjoy your spa treatment and pampering time. Melt all tension away with this exclusive floral facial. Gentle exfoliants and nourishing hydrators are combined for the perfect facial massage. 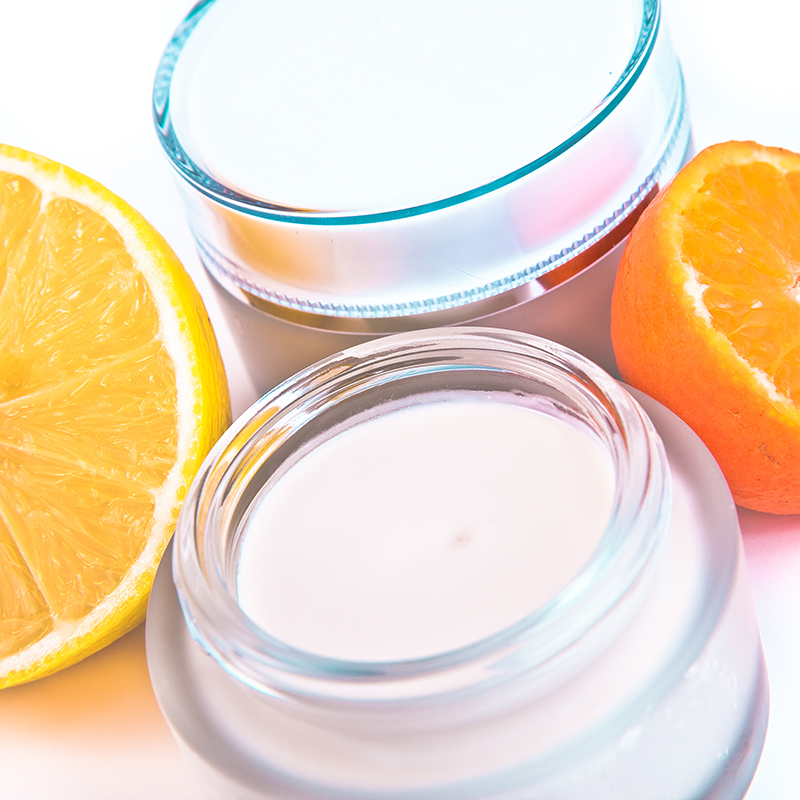 A unique blend of floral enzymes, Vitamin C scrub, and ultrasonic exfoliation will leave your skin rejuvenated and glowing! A soothing leave-on mask tops off your treatment. 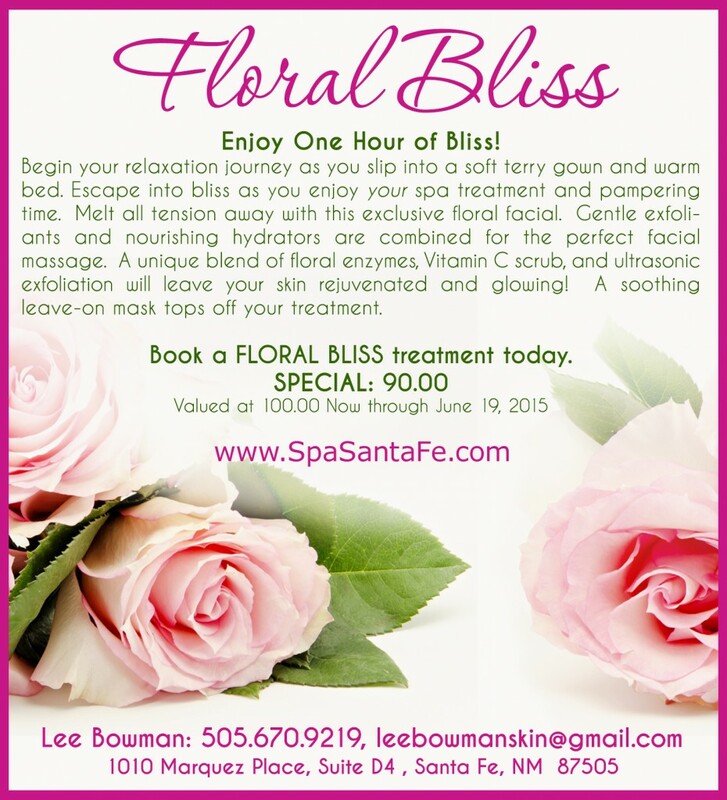 Book a FLORAL BLISS treatment today. Germs lurk in old makeup…resolve now to spring-clean your makeup drawer with these expiration guidelines! MASCARA: its liquid consistency makes it susceptible to bacteria and its close proximity to the eye can lead to possible infections. Replace every 3 months. LIQUID LINER: similar concerns as mascara; replace every 6 months. PENCIL EYELINERS: good for up to 2 years providing you are sharpening your pencil with each use to keep it fresh. FOUNDATION: bid “sayonara” if you notice any changes in smell, color or texture; most foundations will last up to a year, but if you are acne/blemish prone, best to replace every 6 months. LIPSTICK: a long lasting relationship; 2 years. Discard when it becomes dry or changes color. LIPGLOSS: due to its liquid consistency and potential for bacteria to form sooner, best to toss after 1 year. 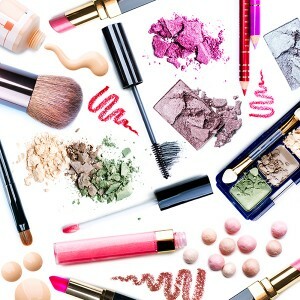 POWDER, BLUSH, BRONZER, EYESHADOW: powder-based products have 2 years shelf life with regular and diligent cleaning of applicators and brushes. Keep track of expiration dates by writing the date of purchase with a sharpie marker on the bottom of each product. Brand New from Skin Script! This fragrance-free moisturizer offers men and women with normal, combination and sensitive skin more options. It balances surface lipids and water and calms irritated skin. Cutting edge ingredients like AquaCacteen is rich in water binding compounds and soothing properties. Olivem® contains a combination of fatty acids for exceptional skin smoothing and long term moisturizing effects. Bisabolol, derived from chamomile, acts an inflammatory to sooth sensitized skin. 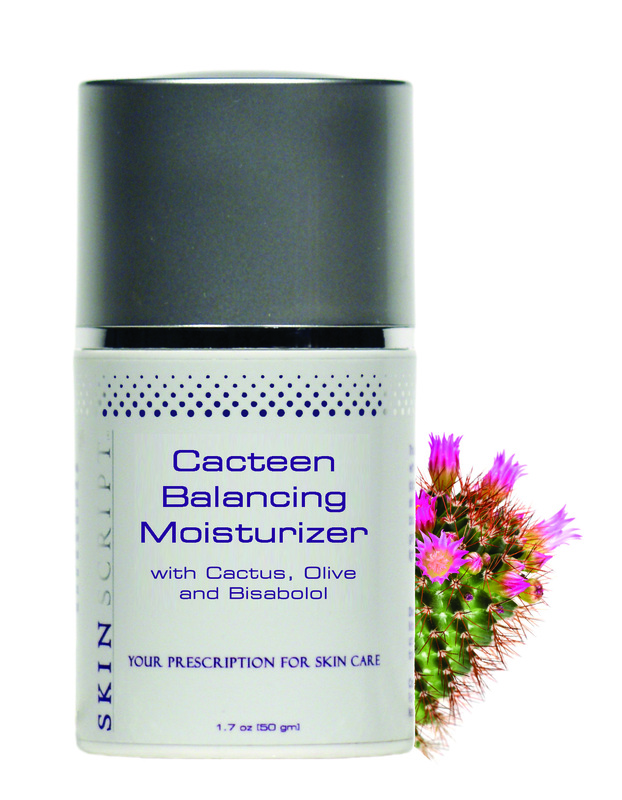 Cacteen Balancing Moisturizer is a mid-weight, non-greasy product with a luxurious satin-like feel that absorbs quickly into the skin. Freshen up your face for Spring with this super oxygenating and brightening treatment! Skin is renewed with an infusion of oxygen, lactic acid and nourishing vitamins to significantly boost circulation and hydration. Skin lightening is further enhanced with an add-on peel. Blemish-prone skin will also benefit from the anti-bacterial properties of oxygen. This high performance facial will produce a healthy radiant glow and is a must for any special occasion. Recommended for all skin types except very sensitive. 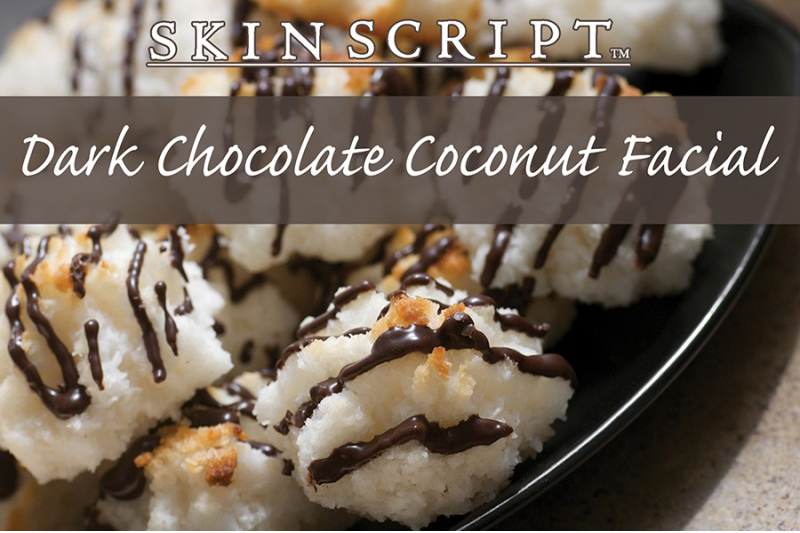 This decadent duo combines the sweetness of coconut and the rich aroma and texture of dark chocolate! Suitable for all skin types, this facial will reveal softer, smoother skin as well as intensively hydrate and tone the skin. Coconut and Papaya enzymes dissolve dead skin cells revealing fresh and soft skin. The smaller molecular structure of coconut allow for easy absorption through the skin. The Dark Chocolate finishing mask contains cocoa, glycerin and squalene, excellent emollients and humectants to draw moisture to dry, flaky skin. Vitamin E provides excellent anti-aging anti-oxidants. Treat your Valentine and yourself to this scrumptious facial feast! Valentine’s Day Special: $75; 1hour; includes sonic exfoliation and décolleté massage. Tis’ the season for soft and glowing skin! Get your face ready to celebrate the Holiday season with this super hydrating, plumping and nourishing treatment. 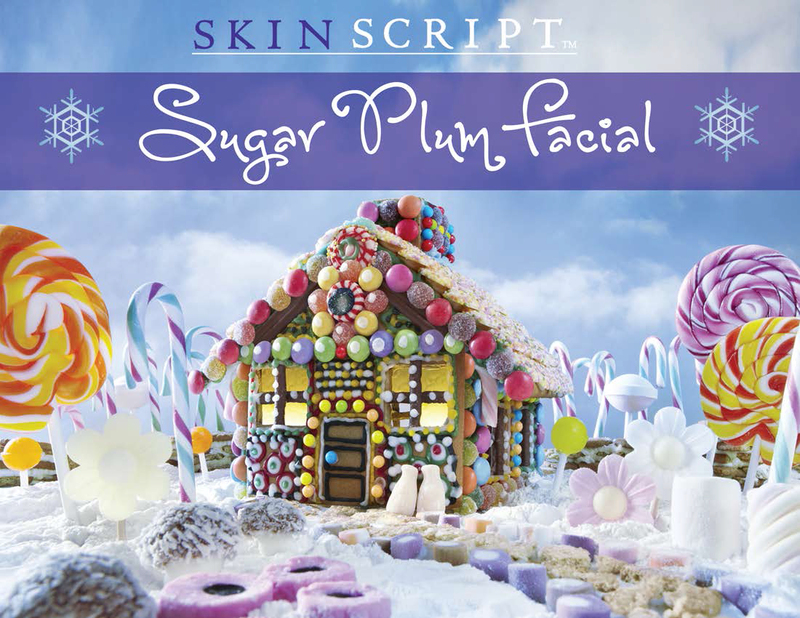 This festive and relaxing facial features a sweet Berry Enzyme and a rich Vanilla Clove Hydrating Mask. Marionberry, Fig and pineapple fruit enzymes gently exfoliate while fortifying the skin with a chockfull of antioxidants. The aromatic Vanilla Hydrating mask locks in moisture and intensely hydrates dry, winter-weathered skin. Recommended for all skin types. Includes sonic exfoliation, light extractions, hand/arm and decollete massage. 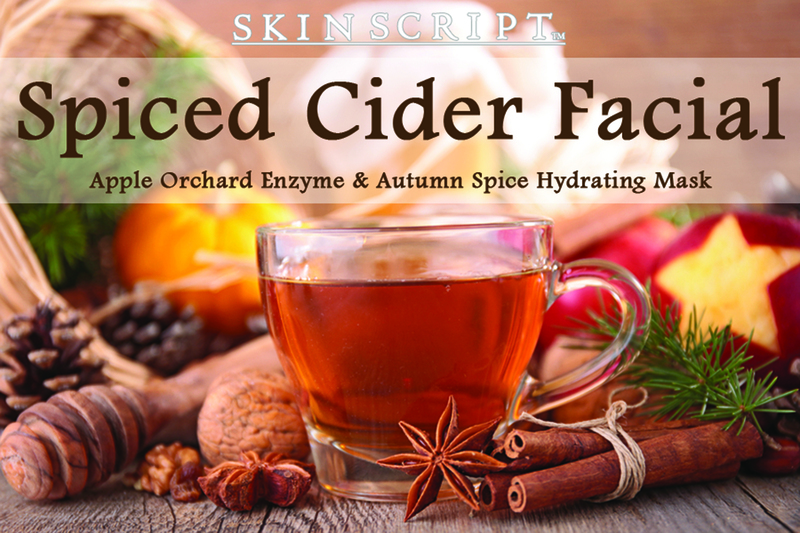 Celebrate the change of seasons with the warming, comforting sensations of our Apple Orchard Enzyme and Autumn Spice Hydrating mask, the perfect seasonal duo. An aromatic medley of classic fall scents including fresh apples, nutmeg and cinnamon are certain to please your senses and reveal a smooth and glowing complexion. This gentle, effective anti-aging treatment features an Apple-enzyme mask rich in Vitamin C, powerful anti-oxidants and malic acid to exfoliate and refine wrinkles. Autumn Hydrating Spice mask uses cinnamon to warm, nutmeg to sooth, and mushroom extract, artic-cranberry seed oil, and glycerin for added nourishment, moisture and hydration. Includes sonic exfoliation, light extractions, and a hand/arm massage. Skin Conditions: Any skin type, except rosacea and sensitive. A spook-tacular blend of of blueberries, goji berries, and yogurt creates the perfect potion for all skin-types. A combination of glycolic and salicylic acid dissolve dead skin cells revealing a frighteningly soft complexion! 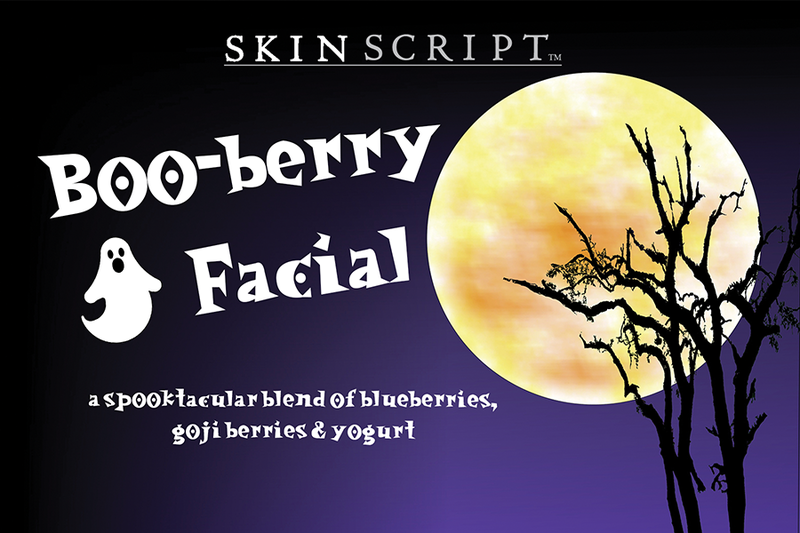 Blueberry brightens the skin and brings gloomy, ghoulish skin back to life! Our Blueberrry Enzyme contains 1% Salicylic and 1% Glycolic to digest desquamated cells and soften sebum. Witch Hazel is used to improve skin tone and is caling. The Goji Berry Yogurt mask features goji berry, an anti-aging superstar, to regenerate and firm the skin while yogurt moisturizes. Anti-aging results can be seen by the reduction of lines and wrinkles in addition to an improvement in the skin’s elasticitity. Includes a Dermafiling treatment, light extractions and a hand/arm massage. This dynamic rejuvenating treatment maximizes the potent anti-aging benefits of Vitamin C paired with ultrasonic infusion therapy to promote smoother, brighter and lifting results. The ultimate solution for aged, sun-damaged skin, Citrus C Peel combines glycolic acid, fruit enzymes and Vitamin C to improve the appearance of dull, tired and hyperpigmented skin; to soften fine lines and surface texture, and to promote collagen synthesis. Following the peel, Ultrasonic infusion enhances delivery of topical nourishment and hydration to skin cells. Our speciality serums, containing collagen-building ingredients, are specifically formulated to be used with ultrasonic technology to plump, firm and reduce wrinkles. This is the ideal time to start an anti-aging skin care regime and to protect your skin hydration before the onset of winter chapping and dryness. 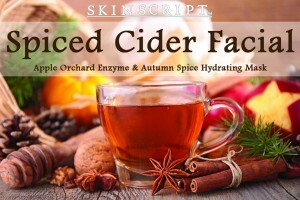 Dehydrated skin is a common condition experienced as we transition from summer to fall. The ambient moisture is significantly reduced at this time of the year which indoor heating further compounds. Dehydrated skin lacks water and does not discriminate between dry, combination or oily skin types. Sufficient water intake is critical in maintaining body health, but in itself will not correct surface dehydration. The key to treating dehydrated skin lies in replenishing moisture and preventing further water loss. Use a moderately rich creamy cleanser. Avoid using products from the sodium laurel sulfate family as they are know irritants. Apply hydrating and moisturizing products on dampened skin within 60 seconds of cleansing your face to lock in moisture. Limit your time bathing or rinsing your skin as too much water damages and weakens your skin barrier and leads to dehydration. Wash your face with lukewarm water and avoid hot showers. Apply a water-based hydrating toner that has beneficial ingredients such as anti-oxidants and skin-restorative substances. Increase application of serums; they are water-based, and have smaller sized molecules that penetrate deeper. Exfoliate your skin regularly but gently. Use an (alpha hydroxy or beta-hydroxy) to help facilitate normal skin cell turn over. Invest in a warm-mist humidifier and use it nightly. bind moisture and retain it. create a barrier between your skin and the environment to prevent evaporation. Look for hyaluronic acid, glycerine, sodium pca, aloe vera, alpha-hydroxy acids, propylene, allantoin, sodium hyaluronate, squalene and jojoba oils in your skin care products. Most sun damage occurs during the summer months. I recommend receiving a facial with a glycolic peel and using products that contain Vitamin C. Vitamin C is an anti-aging superstar and is one of the most effective ingredients to use on sun damaged skin. Skin Script Pomegranate Anti-Oxidant Cleanser: A creamy cleanser infused with a wide array of anti-oxidants, and emollient oils to restore and protect the skin. Skin Script’s “Award Winning” Cucumber Hydrating Toner with “Heavy Water” and Hyaluronic Acid delivers moisture deep in to the skin. Contains high concentrations of Omega 6 essential fatty acid and hydrating benefits. Circadia Vitamin C Reversal: this age defying serum contains the most active form of Vitamin C (magnesium ascorbyl phosphate) to increase firmness and neutralize free radicals. It also contains hyaluronic acid and Vitamin B5 to hydrate, plump and sooth. This elegant formula glides on beautifully and leaving skin velvety smooth and radiant. A true “miracle worker!” Introductory special through 11/15. Skin Script Glycolic/Retinol Pads: designed to gently and progressively renew the skin providing brightening, clarifying and restorative benefits. Contains natural skin lighteners to inhibit melanin production and reduce pigmentation. Oxygen Botanicals Super Hydrating Moisturizer: This nourishing, non-greasy, and emollient formula prevents moisture loss with orchid oil and hyaluronic acid. Additionally, it is infused with pure oxygen. Stock up now; purchase 2 jars and received 20% off your second jar.